Ever read about someone in a magazine and feel the need to visit their burial place? Yep, me too. Such was the case with Julia Force. I read about her in the Summer 2010 edition of Georgia Backroads magazine. A great article by Gaynie G. Guy and Hugh T. Harrington entitled "Julia Force: Victorian Murderess" told of a crime that had the whole nation following along to find out Julia's fate. In February 1893, Julia Force shot and killed her two sisters, Florence and Minnie, in Atlanta, GA. She was subsequently tried for murder. Julia was not convicted, however, by reason of insanity. She spent the rest of her life in the Georgia Lunatic Asylum located at Milledgeville, GA, where she died 30 March 1916. As to whether or not Julia was truly insane is debatable. During her time at Milledgeville, Julia befriended a matron of the women's building named Johnanna Mitchell Darnell. ("Sent to Milledgeville," maybe with a raised eyebrow, is all anyone has to say around here, and the meaning is crystal clear, even to this day.) Mrs. Darnell was a granddaughter of former Georgia governor David B. Mitchell. She arranged for herself and Julia to be buried upon their respective deaths in Governor Mitchell's plot at Memory Hill Cemetery in Milledgeville. Though the slab is unmarked, it is easy to pick out Julia's grave. She is closest to the base of the magnolia tree in the Mitchell lot. 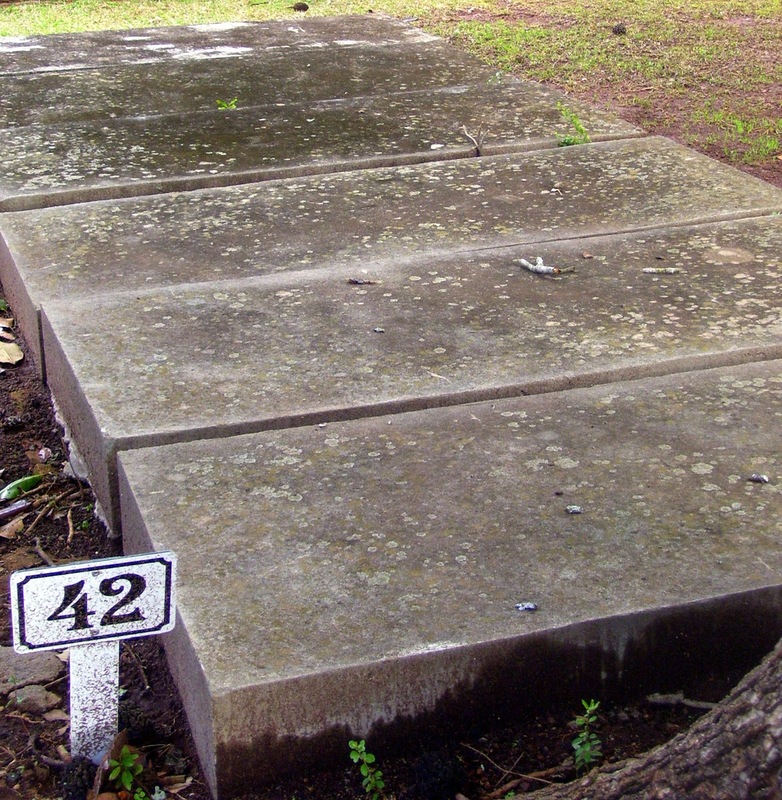 Her grave is also now marked by a number 42. This is because she is mentioned in Memory Hill's walking tour brochure as a point of interest. I wonder if Governor Mitchell could ever have imagined that a murderess would be laid to rest less than six feet from his remains almost 80 years after his death. · If you are interested in learning more about the saga of Julia Force, please follow along a series of posts containing transcriptions of newspaper articles of the time at the Your Peachy Past blog. I posted the first entry this morning. · Central State Hospital (the name it is currently known by) in Milledgeville, Georgia was founded in 1842. As briefly touched upon, it is still active and a well-known facility to this day. · Memory Hill Cemetery has a fabulous online presence. You can search their database of burials and download the walking tour brochure. · Lastly, Julia's murdered sisters were laid to rest in Oakland Cemetery of Atlanta. Georgia Backroads is a great little magazine! Thanks for highlighting this story. I'm delighted that you enjoyed the article on Julia Force. Also pleased that you like the Memory Hill website and walking tour. And, I agree that Georgia Backroads is a great little magazine. Thank-you for stopping by, Hugh! Emalee's Time - Is That a Pocket Watch I See?